As a marketer, there are times when I think no one is really thinking about consumer reaction when it comes to branding technology. 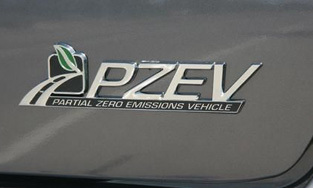 PZEV stands for "partial zero emission vehicle." You can read the full definition from wikipedia. But it basically means they are "close to" meeting the California Air Resources Board's stringent zero emission standards in California. But close only counts in horseshoes! It's just the auto industry and California doing a little political dance. But this kind of marketing can confuse consumers, who are already trying to make sense of alternative fuel technologies for cars. From hybrids to ULEV (ultra low emission vehicle) to the upcoming zero emission electric vehicles, such as the Chevy Volt and Nissan Leaf, marketers need to do a better job explaining things to consumers. And something like "partial zero emission" is an oxymoron to me. Either you are zero emission or you are not! Auto makers, stop the marketing spin and just call PZEV what it really is: a INACAWWL vehicle. ("It's not as clean as we would like" vehicle).